- Publisher A scriptural, balanced, uplifting approach to present-day spiritual warfare that will: Teach how to zero in on and quickly identify the strongman in every situation; Illustrate each strongman by a tree showing the fruits or symptoms for quick identification; Instruct how to bind the Enemy and loose the power of God according to Matthew 18:18; Provide instant recognition when and where Satan is attacking our lives and the lives of those around us; and Show that God wants us to be free from Satan's hassles so that we can reach this world for Christ. - Publisher Instead of "binding" symptoms of sickness, we can attack the sixteen strongmen or demonic spirits mentioned by name in the Bible. God names them, they are real, and He has given us dominion over them through the name of Jesus! Here is a scriptural, balanced, uplifting approach to present?day spiritual warfare. 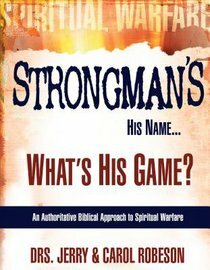 About "Strongman's His Name...What's His Game?" A scriptural, balanced, uplifting approach to present-day spiritual warfare that will: Teach how to zero in on and quickly identify the strongman in every situation; Illustrate each strongman by a tree showing the fruits or symptoms for quick identification; Instruct how to bind the Enemy and loose the power of God according to Matthew 18:18; Provide instant recognition when and where Satan is attacking our lives and the lives of those around us; and Show that God wants us to be free from Satan's hassles so that we can reach this world for Christ. Instead of "binding" symptoms of sickness, we can attack the sixteen strongmen or demonic spirits mentioned by name in the Bible. God names them, they are real, and He has given us dominion over them through the name of Jesus! Here is a scriptural, balanced, uplifting approach to present?day spiritual warfare.